The New York Post says bodyguards for New York Mayor Bill de Blasio (D.) removed one of its reporter from a parade event after he tried to ask the mayor a question. The bodyguards, who are New York Police Department officers, removed Kevin Sheehan from the city's annual Dominican Day Parade, the Post claims. Sheehan was attempting to ask the mayor about a story from the Post about meetings between de Blasio officials and lobbyists. The incident occurred after de Blasio cut a ribbon to start the parade and was posing for photos near West 37th Street and Sixth Avenue. "Kevin, you have to leave. You can’t be here," an officer said to Sheehan. An officer grabbed Sheehan by the shoulder as they escorted him away. The reporter was wearing his NYPD-issued press badge at the time. "Come on, Kevin. No stunts today," NYPD Public Information Officer Brian Magoolaghan told Sheehan a half-block away from where officers first stopped him. A Post tweet about the incident includes a photo it says is of a bodyguard removing Sheehan from the vicinity. When the Post asked de Blasio's press office about the incident, they referred the matter to the NYPD. "The Department takes appropriate and necessary measures to protect dignitaries, including the Mayor of the City of New York," the NYPD said. De Blasio has previously called the Post a "right-wing rag," and he criticized the publication on Sunday while speaking with CNN's Brian Stelter. Earlier Sunday, de Blasio appeared on CNN’s "Reliable Sources" to discuss an interview last week with the Guardian, a liberal British newspaper, in which he criticized The Post’s parent company, News Corp, and its founder and executive chairman, Rupert Murdoch. At one point, host Brian Stelter pressed de Blasio about his criticism of The Post, which the mayor has called a "right-wing rag." "Why do you feel it’s your role to be calling out a newspaper because you don’t like the content?" Stelter asked. "Because I think it’s not happening enough. 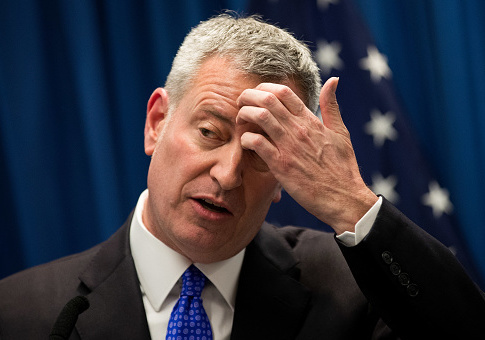 … It’s not happening the way I think it should," de Blasio answered. De Blasio also tried to promote his support for a "free, strong media" during the interview. "I believe in a free, strong media with diverse views — I’ll defend it with all I’ve got," he said. Update 11:05 A.M.: Piece was updated with tweet from the Post. This entry was posted in Politics and tagged Bill de Blasio, Media, New York City, Police. Bookmark the permalink.